New figures show strong growth in the number of overseas visits to the UK from markets including China, Australia, France and the US in the first three months of 2017. The figures released by VisitBritain show it was a record first quarter for overall inbound visits and spend, with 8.3 million visits, up 10%, and spending up by 16% to £4.4 billion compared to January to March last year. The UK saw a record 54,000 visits from China from January to March this year, up 27% on the same period last year, with visitors spending a record £91 million, up 27%. The statistics also show that in first three months of 2017, visits from the US, the UK’s most valuable visitor market, grew by 16%, to 641,000, compared to the same period last year, with visitors spending a record £604 million, up 29%. Visits from Australia set a record for quarter one, up 10% on last year to 174,000, and spend up to £180 million. Strong growth was also seen from France, with 991,000 visits, up 9% on the first quarter of last year, and spend up 15% to £321 million. 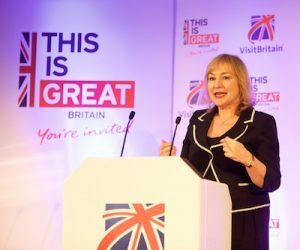 VisitBritain director Patricia Yates said: “It is very encouraging to see such strong growth from some of our largest and most valuable markets, including France and the US, as well as markets that are important for our future, such as China. Latest data from ForwardKeys shows that flight bookings from China to the UK are tracking 35% ahead for July to September compared to the same period last year, and 21% ahead from the US to the UK. Bookings overall for international arrivals to the UK during the summer are currently tracking 9% ahead of the same period last year. Other markets showing strong growth in the first three months of this year include Belgium, Denmark, India and Japan. Visits from India grew 32% to 68,000, while visits from Brazil were up 16% to 53,000. A new record was set for the number of inbound visits from Spain, which grew by 18% to 656,000, and spending up 17% to £230 million, another quarter one record.